As was the case on Saturday, Sunday’s Global RallyCross action from Munich would be broken up into 4 heat races and the Last Chance Qualifier that would decide the starting order for the final race to Gold. Unlike Saturday, Sunday’s race saw sunshine and drier racing surfaces for the 17 drivers entered into this weekend’s XGames rallycross festivities. In case you missed it, click here for a look at our coverage of the Munich XGames GRC race #1. Heat #1 brought out Toomas Topi Heikkinen, Anton Marklund, Steve Arpin and Guiga Spinelli with Topi grabbing the early lead with a great launch with Marklund sitting second while Arpin was third. Leading into the third lap, Arpin’s use of the shortcut “joker” turn allowed him to take the second spot from Marklund and Anton’s hopes ended on the 4th lap when a steering failure sent his VW hard into the outside wall. After that big impact, Arpin easily drove to second – way behind heat winner Heikkinen. Heat #2 featured Sverre Isachsen, Mattias Ekstrom, Bucky Lasek and Bryce Menzies and after a sloppy start by everyone but Ekstrom – his VW Polo led the field through the first turn with Lasek, Isachsen and Menzies close behind. The two Subarus of Isachsen and Lasek would continue to battle for the second transfer spot with Isachsen eventually claiming the second spot but Bruce Menzies and his Dodge Dart disappeared from the field during the 4th lap of the race with more mechanical issues. Heat #3 saw five racers take the field including Patrik Sandell, Ken Block, Liam Doran, Scott Speed and Dave Mirra. All five cars got off to a great start with Doran claiming the early lead followed by Block, Sandell while Mirra and Speed raced off of the lead pace a bit. Doran and Block would continue to battle but the Hoonigan Racing Fiesta of Block was unable to get around Doran’s Mini (that claimed Gold on Saturday). 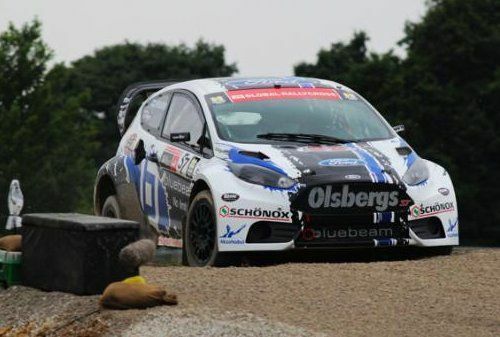 Sandell’s Fiesta remained a close third but he was never able to really battle with Block for second. Heat #4 brought out the last 4 drivers who would try to claim one of the top two spots to send them into the final race. This field included Tanner Foust, Timur Timerzyanov, Townsend Bell and Brian Deegan with Foust taking the starting line advantage before Deegan snuck into the top spot after just a few turns. Deegan spent the next few laps pulling further and further away from the field while Tanner Foust had what looked to be a pretty easy drive to claim the second spot even with some minor technical difficulties. The Last Chance Qualifier (LCQ) saw nine cars battling for the last two spots in the final race for XGames Gold. The front row included Sandell, Timerzyanov, Lasek and Spinelli. The second row had Marklund, Menzies, Bell and Mirra while the third “row” was comprised of only Scott Speed. Sandell grabbed the early lead with Scott Speed taking second but a crash by Dave Mirra forced the field into a red flag restart. Excluding Mirra, the field restarted just like they did on the first attempt with the intention of running 4 fresh laps and when Scott Speed got a bit too aggressive and caused a big mess in turn 1 – Timur Timerzyanov was able to grab the early lead over Townsend Bell…only to have the red flag come back out for Speed. This meant another restart for the field but this time, only four of the cars were able to line up. Only Bucky Lasek, Timur Timerzyanov, Guiga Spinelli and Townsend Bell lined up for the third start of the LCQ. Timerzyanov got a great start and nabbed the lead only to have an explosion of white smoke pouring from the back end. Timur continued to try to keep up with the leader Bell until the motor expired altogether…leaving Bell and Spinelli to essentially coast into the final race. In the final run of Munich XGames Global RallyCross race #2, Toomas Heikkinen, Brian Deegan, Mattias Ekstrom and Liam Doran lined up on the first row; row two included Sverre Isachsen, Ken Block, Tanner Foust and Steve Arpin and row three was filled by Townsend Bell and Guiga Spinelli. After a premature launch by Ken Block, the field raced hard into the first turn with Liam Doran and Topi Heikkinen took the top two spots. Topi quickly claimed the lead and pulled out away from Doran, Foust, Bell and Isachsen while Ken Block made his stop and go penalty on the 3rd lap of the race. The mid laps of the final event were fairly uneventful with Heikkinen posting a big lead over Doran who also had a large advantage over Tanner Foust. Nothing would change up front as Topi Heikkinen would drive to victory so easily that the front end of his Ford Fiesta didn’t have any dirt on it come the end of the race. In the end, Topi took the XGames Gold by a massive margin over Doran (Silver) and Tanner Foust (Bronze). This was Heikkinen’s third XGames medal with his first Gold following his Bronze on Saturday and his previous Silver medal. For Doran, the Silver medal in addition to the Gold on Saturday made for a remarkable first weekend of racing for the new Mini race team. I have attached a video of the Munich Sunday races for those who missed it but I should point out that the later stages of the LCQ race are not included but the rest of the action is there.